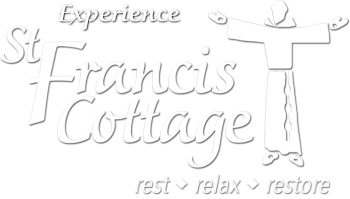 St Francis Cottage is a special getaway on 2.3 acres near Chattanooga, Tennessee, conveniently located about a mile from the I-75/Hamilton Place Mall Shopping Complex and three miles from the intersection of I-24 and I-75. Whether you're a Florida traveler; in Chattanooga for business, an event or convention; visiting family and friends; or on vacation, our doors are open to you. If looking for a true bed-and-breakfast experience with the friendliness of owner-innkeepers that are committed to service, then St Francis Cottage is the place for you. Settle into an exquisitely-appointed, comfortable room, each with a private bath, then stroll the gardens, enjoy coffee, tea or a Coke on the back deck overlooking the gardens. Feel free to review our restaurant guide to select one of the many fine restaurants in the area for dinner, and everyone is welcome to gather at the Cottage for an evening Social Hour with complimentary wine or beer. Wake up to the smell of organic coffee brewing and the preparation of your full, complimentary breakfast of healthy, sustainable, Southern-comfort food while enjoying the view of the trees, gardens, and birds as they flock to the bird feeders on the property. Choose to savor your breakfast in the dining area, in the garden, or on the deck. Our gathering place is a spacious great room that allows travelers to socialize and relax around the fireplace. You also have access to a comfortable library and a 24-hour beverage bar. During warmer months, relax with a book in one of the sitting areas in our perennial gardens that extend from the large rear deck surrounded by mature hardwood, pine and cedar trees. St Francis Cottage is the perfect picturesque setting for a small wedding or a family, business or social event. Whatever your travel needs, we aim to serve you and yours at St Francis Cottage. Welcome to St Francis Cottage where we offer guests the choice of seven unique, divinely-appointed guest rooms, each designed with comfortable furniture, eclectic accents, and luxurious modern amenities. We offer personal, Southern hospitality with state-of-the-art 21st-century technology. Begin your day in the Chattanooga Valley with a plentiful breakfast of comfort food, Southern-style, at St Francis Cottage. First, settle in with a cup of freshly brewed coffee or tea at one of the dining tables or a cozy chair by the fireplace in the Great Room while you read the newspaper.